Fermanagh man Michael Leonard is not just your average Mr Nice Guy. Behind the blue eyes and the white smile lies a talent that is rare to find these days. Michael began playing the piano when he was seven and, as the years rolled by, he began to play guitar and the drums. At the age of sixteen, he began writing songs and this has become his single, most favourite hobby. He looks for inspiration from his rock idols including Jimmy Hendrix, Counting Crows and U2. "I have so many favourites, mainly rock-orientated bands. My favourite is U2 - I've been a big fan of them since the age of ten". Though Michael was disappointed that he hasn't yet been offered a viable record contract, he is now concentrating on his song-writing abilities. 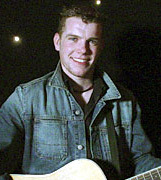 He has since co-written a song with Westlife front-man Brian McFadden and both Brian Kennedy and Simon Casey have expressed interest in recording some of Michael's songs. Michael is living out of a suitcase at the moment; his life has been a whirlwind of excitement since the show. He has been touring the country with his best friend Brian Ormond. He has had much publicity since leaving the show, having appeared at the Grand Opera House in Belfast with Westlife. He has also appeared on BBC Choice, SKY TV, Belfast's Let me Entertain You gig and the charity gig in the Heritage Hotel. He is overwhelmed with the response that he has received especially in his hometown of Belcoo. "I went back for my homecoming recently and it was unbelievable. There were so many people there from all over the country. Simon Casey and Brian Ormond were there too and we were brought through the town in a limousine and given the treatment," he says proudly. Though he loves the attention, he feels that he needs his space and so he has decided to take a well-deserved break to Spain and Brazil to "chill out". Michael believes that You're a Star was the best experience of his life. Though it was tiring and stressful for him, he made many friends, many of whom he keeps in contact with including Simon Casey, Brian Ormond and Susan McFadden. He didn't have any expectations when entering the You're a Star contest and is happy that he made it to the second phase. "I didn't think that I would even get as far as I did. I just concentrated on my performance every week and I kept getting put through to the next round," he states. His best memory of the show is his audition in Belfast. "Phil Coulter asked me to stop playing half-way through the song," he says. "I was gutted and wondered what I did wrong. He said 'Son, that's the best audition I've ever heard. Will you do me a favour and play it again'. So I did and he told me I was through". His worst memory of the show is the time when Susan McFadden was voted out. "We weren't together at the time, but I felt that she shouldn't have been put out. She was far too good and didn't deserve it", he says. So now that his relationship with Susan is confirmed, does he find it hard to find a balance between his love life and his new-found fame? "It is difficult to have a love life with all the gigging that I'm doing. It's also hard on my family. But if I approach it right, I should be OK. There's nothing that I love more than going back home to chill out with my dad. I love going to the pub on a Sunday night with my dad and uncles for a few pints," he declares. He has many plans for the future, one of which includes making a million euro! "Making a million euro is my sole aim and I hope to do this by writing a few number one hits. I know that money doesn't bring happiness, but it does bring comfort. I want a family of kids and I want to be able to provide them with comfort," he says shyly. At the mention of a possible record deal, his eyes dim and he nods his head. "Everyone that I ever talk to ask me whether I've been signed yet, who I've been signed to and when I am releasing a single. I was told after the show that there were three record companies interested in signing me. However, that wasn't the case. That's the music business for you." So the question left to be asked is whether or not Michael Leonard will make it big enough to be able to earn his million euro. He appears to be a very determined and talented young man and I've no doubt that, in the end, he will make his money and his name in the world.